Put all the functionality of the babelforce platform right at the heart of your Freshdesk customer support software. At babelforce, we just love to integrate. Our goal is to make it possible for you to create any automated process across tickets, your data and communications. 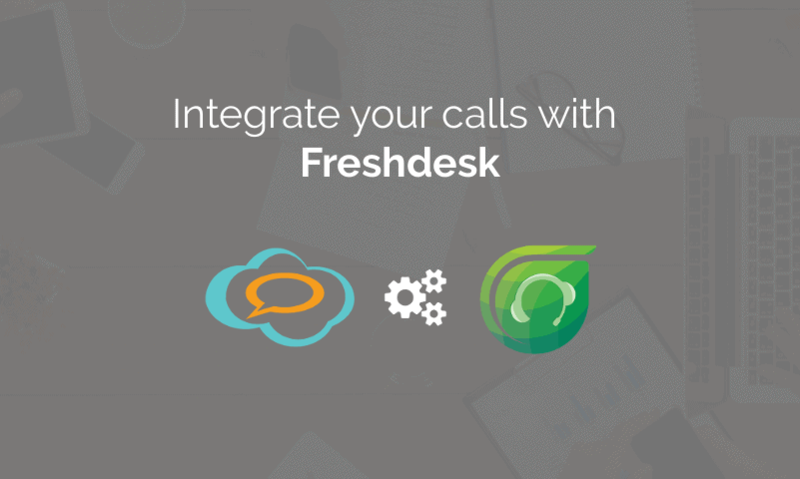 We’ve launched a new integration for Freshdesk that puts a complete communications platform at the heart of your customer service. Our team has been working at this one for a while, and now we’re ready to pop the champagne and cut the ribbon – babelConnect for Freshdesk is ready. Typically the toughest part of any new integration – from the client perspective – is the initial setup. We know it because we’ve lived it, and we’ve seen how many promising integrations have fallen at the first hurdle. Nobody wants to invest in integrated phone support only to find that implementation it is going to eat up several days. Stakeholders routinely report that issues with integration are among their primary concerns, so we’ve been ruthless in stripping out absolutely every unnecessary step. Setting up babelConnect is as simple as creating an account, installing an extension, and adding the phone numbers and agents you need. So, we know the setup is easy – but what does babelConnect actually offer? The contact center works through the collaboration of a lot of different systems, which ideally need to talk to one another. There are too many businesses where systems like CRM, ERP, and BI operate in their own space without sharing data with one another or with core customer support software. You’ve heard of the silo effect before, but it’s more like a middle school prom – the sporty kids in one corner, the science kids in another, all the girls ignoring all the boys. babelforce can get them dancing. Our deep integrations across APIs enable data and inputs from any source to flow freely wherever you need them to go – that includes legacy systems as well as shiny new cloud products. Much as CXOs might want to replace their legacy systems, most of those are going nowhere fast, so rather than worrying that they’re a millstone around your neck, you can focus on the helpdesk integration with calls and other functionality. babelConnect isn’t a tool – it’s a toolkit. You might say that automation is central to what we do. I must have asked a hundred CIOs why the simple process automations that could save them hours per day never happen. What am I told? ‘We wouldn’t know where to start’. Only 24% of call center leaders enjoy full process design with their enterprise which I think explains a lot of the inefficiencies that creep in. With babelforce actions for Freshdesk API, any automated workflow can be created and edited quickly and easily. How quickly? Once you have a goal in mind, you can create a workflow in days, or even hours. How easily? Without needing to write a single line of code, or drawing from specialist knowledge, any professional can change processes. There’s really no limit to the kind of automations that you can create. If you understand your call center processes, (which you do) you already have what you need for complete phone support integration. 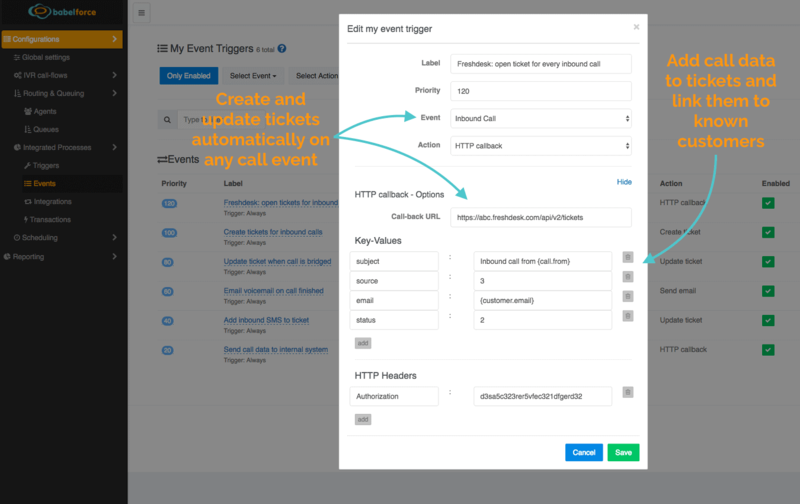 Integration and automation are the big, high-level features going on behind the scenes; next in this whistle-stop tour, let’s take a look at some agent-facing additions you’ll use as part of your integrated phone support. 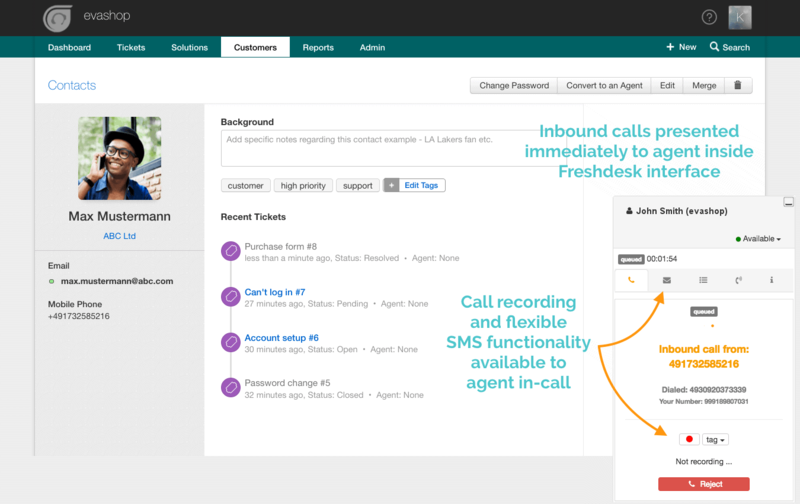 babelConnect links Freshdesk agents to a global enterprise-grade communications platform, and puts them in full control of their inbound and outbound calls. Click-to-dial functions, integrated SMS and call recording are always at their fingertips through a standard dialog box that goes wherever they go. That’s no accident either; research from Call Centre Helper has shown that half of call center agents have to use at least five different applications to help customers, and 23% use ten or more. Having to continually reorient is deadly to agent effectiveness. Basically, they can never find the right tools at the right time. Sometimes the delay might not matter too much, but when it comes to call recording it can matter a lot. Whether it’s internal policy, industry specific standards, or general PCI compliance, letting agents control call recording behaviours ensures that your requirements can easily be met. With GDPR just around the corner, fines for data breaches are likely to escalate dramatically. Now is the time to make sure that your compliance is absolutely watertight. We’ve created a dashboard that can feature whatever information is most useful to your contact center and its staff. This enables leaders to monitor progress throughout the day, making course corrections as needed and being more responsive to trends. 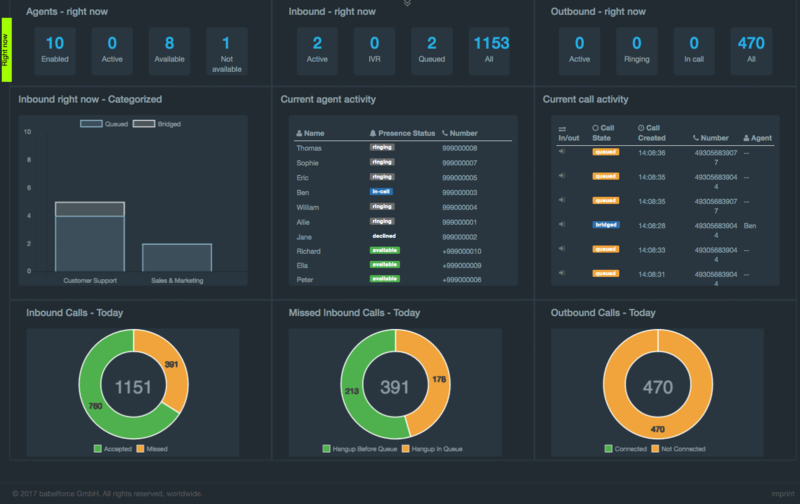 A lot of our customers choose to run their dashboards through wall monitors and share the data with their staff, to keep them informed about inbound and outbound traffic. Phew, that’s a lot of information to deal with. But it boils down to this: with babelConnect you can take your Freshdesk Customer Support Software to the next level. Integrate the right systems – automate the right processes – let agents control their calls.